ForeignCorrespondent: Who Won and Who Lost in the 2012 Election? Who Won and Who Lost in the 2012 Election? The Presidential election of 2012 was less of a contest between Republicans and Democrats than it was a battle between those who want the government to give them "stuff" and those who feel, as JFK once said in 1960: "ask not what your country can do for you, but what you can do for your country." Democrats who elected President Kennedy in 1960 were not the same as those who elected Obama in 2008 and reelected him Tuesday. Those Democrats still believed in the bedrock values of hard work, self-reliance and the traditional family that made America the economic and political beacon of the world. Today, with Obama's reelection, I fear the nation is moving further down the slippery slope to bigger government, greater dependency and quite possibly European style of socialism. For example, today, more people than ever before depend on the federal government for housing, food, income, student aid, or other assistance once considered to be the responsibility of individuals, families, neighborhoods, churches, and other civil society institutions. Let's look at some facts. · For the first time in our history 50 percent of Americans pay no income taxes--meaning that those who are productive contributors to the economy are supporting those who are not. · The number of Americans on welfare has increased from 97 million to 107 million since President Obama took office, according to research by the Senate Budget Committee. · Some 47 million Americans already are on food stamps. 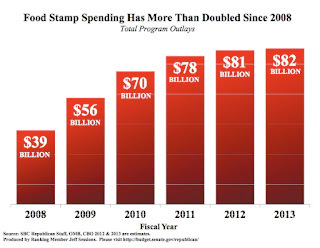 · Almost 71 percent of all federal spending goes to dependency creating programs. · The American public's dependence on the federal government shot up 23% in just two years under President Obama, with 67 million now relying on some federal program, according to a newly released study by the Heritage Foundation. · Last year, the Wall Street Journal reported that 49% of the population lives in a household where at least one person gets some type of government benefit. What Obama has done and what he will continue to do is expand the culture of dependency that the Democrat Party thrives on. Poverty is a trap. It causes long-term welfare recipients to lose job skills and work habits and ultimately they wind up failing to participate in a marketplace that can lead to new and better jobs. What we saw in this presidential election was a mandate for Obama to continue the tax and spend policies that place a greater economic burden on productive members of society so Democrats can continue to win votes from those who feel they are entitled to more and more government handouts. Our national debt is already at $16 trillion but watch out. You ain't seen nothin' yet. Under another four years of Obama it will likely grow to more than $20 trillion and as it does, the dollar will become a joke in global currency markets. To some extent it already is. Under Obamacare, Medicaid is set to explode as well. Within just one generation, total federal spending could reach nearly 36% of GDP, and the Congressional Budget Office says debt held by the public could reach nearly 200% of GDP. These are facts that those who voted for Obama ignored or were too uninformed to understand. 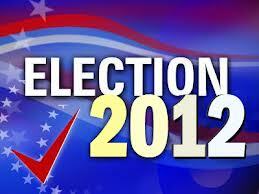 I grew discouraged listening to people in exit polls explain why they voted for Obama. "I think he is good looking," said one 20-something woman..."and he cares about my right to have birth control and for the government to provide it." Wait a minute. Since when is it a "right" for birth control and for the government to provide it? If it's in the Constitution or the Bill of Rights, I must have missed it. At one polling place Obama voters were asked what party currently controls Congress. The answer from several dozen people asked: "Republicans." Uh huh. Others were asked to identify Nancy Pelosi and Harry Reid. They couldn't. One woman said this: "Obama did lots of great things besides killing Osama bin Laden! I just don't want to talk about any of those things right now, for no particular reason." Thank God! It's depressing enough to learn that these are the people who helped re-elect one of the weakest presidents in our history without having to listen to them attempt to speak coherently about why they did it. But hey, these are the "winners" in this election...and the rest of us get to continue to pay the bills.